But I didn’t realize Knob Creek came in a Single Barrel edition until a friend recently bought me a bottle. (He owed me after he polished off most of a bottle of my Baker’s.) 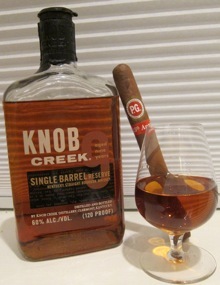 Sure enough, late last year Knob Creek came out with its first single barrel Knob Creek. I t’s the first expansion to the Knob Creek line since the brand debuted in the early nineties, and not only is it single barrel, its bottled at barrel strength (120-proof). While Single Barrel is a bit more expensive than the original Knob Creek expression at $40, you get more bang for your buck at a higher proof, plus each bottle takes on its own character because the liquid contents only come from a single barrel. The Knob Creek Single Barrel has a deep amber color. The nose features oak, orange peel, vanilla, and spice. The initial flavor is toasted corn, burnt orange peel, vanilla, and an abundance of cedar. Also evident is a rich smokiness and hints of mint. The finish lingers with toasted notes. All in all, I thoroughly enjoyed the Knob Creek Single Barrel. The spirit is deep and intense yet balanced and rounded, which is impressive given its significant alcohol content. And it’s also only $8-10 more than the original Knob Small Batch, which makes a no-brainer in my book. Not surprisingly, it’s a dream to pair with a fine cigar. Enjoy it with a medium- to full-bodied smoke with similarly balanced and rounded flavors. I can attest that the La Flor Dominicana Cameroon Cabinet, PG 15th Anniversary, and Don Pepin’s My Father all hit the mark. Taking price into account, I may have just found a new favorite bourbon (it’s certainly in the top three) which brings me to my only two regrets about this spirit: First, that it took me over six months to try it. And second, that since I took the above photo, the level of bourbon in my bottle has dropped significantly, so I’ll soon have to pick up another. Thanks for the review. If smoking a Padron 1964 Anniversario, would you prefer the Knob Creek or Booker's True Barrel? In my opinion you couldn't go wrong with either one. But if you really pressed me, I'd say pair a Padron 1964 natural with the Bookers and a Padron 64 maduro with the Knob Creek Single Barrel. Thought being the Knob Creek has a little more spice and heat to contrast with the maduro sweetness. Still both excellent choices for one of my favorite smokes. Have not tried this one yet, but thought I would mention the new 90 proof Beam. It's worlds better than the original IMO. Thanks for the review. I recently was introduced to bourbon by the folks from Astor Wines in NYC. He suggested that I try Eagle Rare Single Barrel. Since I never had any bourbon before I didn't know what to expect but when I removed the cap I was greeted by a wonderful aroma. It is smooth to this rookie. I have paid between $21 and $31 for 750 ml. Enjoy!